Right Space. Right Fit. Right Time. A. Duie Pyle Warehouse & Distribution services seamlessly integrate with our LTL, Brokerage and Custom Dedicated solutions to meet the needs of our diverse client base in a variety of industries and sectors. With 10 warehouse facilities and over 2.2 million square feet, in tandem with our own LTL fleet, A. Duie Pyle is able to provide next day service to over 90% of the Northeastern United States and parts of Eastern Canada. The northeastern corridor is complex, congested, and often directly impacted by adverse winter weather. No single warehousing and transportation company serves this challenging and affluent territory more completely, more diligently and creatively, with more customized equipment and services than Pyle. 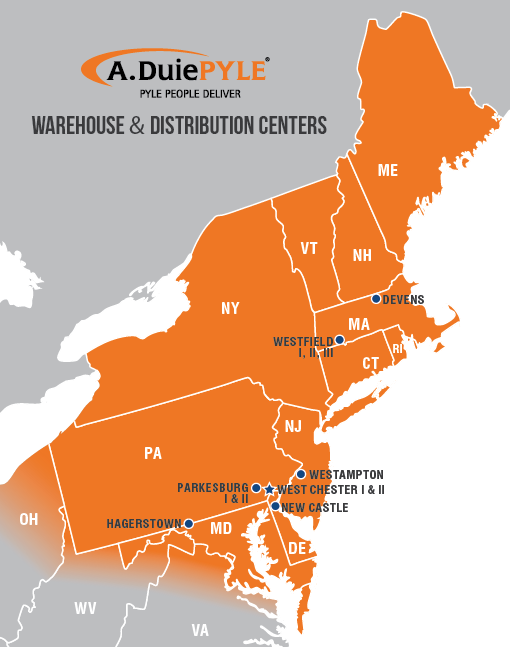 Ideally positioned within the region, A. Duie Pyle is the only fully integrated warehousing and distribution resource providing comprehensive service to the entire northeast and points beyond. Our heated warehouse facilities and specialized equipment and technology, along with the speed and efficiency of our experienced staff, allow our customers to benefit from faster order processing and transit times through snow, sleet, rain, or shine. Our close proximity to ports as well as the availability of our secure indoor rail siding makes it possible for A. Duie Pyle to offer every alternative to meet your changing supply and distribution needs. Through our integrated solutions approach to regional distribution, we are able to provide our customized service and flexibility in sourcing, replenishment and inventory fulfillment. We serve a variety of industries and sectors including manufacturing, chemical, beverage and retail. Food Grade, Temperature-Controlled, Freezable, HazMat and Flammables are all ready to be stored in our facilities while our heated warehouses function to protect your items from freezing year-round. Public and contract space is also available for your temporary, short and long-term needs. Our world-class customer service team and long-term experienced staff are here to provide the utmost care and quality. Every site is staffed with Class A, CDL and HazMat qualified drivers. Warehouse personnel are trained in PPE (Personal Protective Equipment) and OSHA Hazard Communication Standard/GHS, as well as certified in forklift operation and DOT Hazardous Materials. Select employees have Level III HAZWOPER (Hazardous Waste Operations Emergency Response) and Hazardous Waste Management training. Maintenance is handled on-site by full-time Pyle personnel. Our facilities are strategically located in close proximity to major metro areas thus increasing freight velocity to the northeast customer base. Highway, rail, and port accessibility provides options for distributing goods when and where they need to go. Integrated with our LTL, Brokerage and Custom Dedicated Solutions, next day service is possible to 90% of the Northeast, parts of eastern Canada and as far south as North Carolina. Our state-of-the-art Accellos Warehouse Management System allows you to access real time inventory and customized shipping reports. We can fully integrate with a broad range of technology platforms including SAP. The availability of our specialized equipment and RF technology means your orders are always processed accurately and efficiently. When integrated with our LTL solutions, you can communicate order releases later in the afternoon and be certain no pickup is left behind. Our Brokerage Solutions network covers 49 states including Canada, equipping you with the capacity and superior service needed for those large volume shipments. Taking advantage of our Integrated Solutions affords you greater flexibility and improved freight velocity. Let our team help you determine the best fit by integrating multiple service models under one agreement. Our light assembly and customized value-added fulfillment services give you more options than just storage. With over 2.2 million square feet of space, we can significantly reduce order turnaround times and improve profitability by stocking a wide range of products. We understand that each customer has unique requirements, so our Solutions Design team will work to engineer an optimal, customized fulfillment solution specifically catered toward your needs. Let our experienced staff prepare your orders with accuracy, efficiency, and care. All warehouse facilities are equipped with monitored sprinkler and alarm systems to ensure that your products are safe in our hands. An on-site flammable room with special safety features allows for the safe storage of flammable liquids and each facility is registered with the appropriate government agency according to the products being stored. At Pyle, we are proud of our own environmental and energy conservation initiatives and the contributions that our company and employees are making in preserving our environment. Among other initiatives, in 2010 we installed over 4,000 solar panels at our Parkesburg warehouse, enabling this 570,000 square foot facility to run on 100% Solar Energy. Access the A. Duie Pyle Warehouse Management System directly.